How Can An Effective Electronic Referral Management System Improve Care Coordination? The relationships between PCPs and specialty care providers must evolve and improve to enhance care coordination. In order to do that healthcare organizations must adopt the advanced medical technologies. However, in the recent decades, the healthcare industry has been slow in adopting new technologies. Did you know? According to the News & World report, medical errors are the third leading cause of death in the U.S. 10% of U.S deaths are due to preventable medical mistakes! Documentation – During the referral process, referring physicians tend to miss out valuable patient information. Many times vital symptoms and findings from initial tests are often not sent with the referral order, leading to health complications that could have otherwise been avoided. Leadership disconnects – The leadership team should know which doctors are referring patients to specialists. 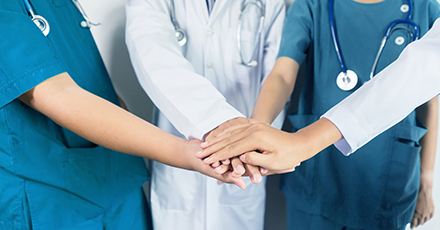 Well connected team structure enables educational conversation between leadership and care providers regarding over utilization, referrals to high cost specialists, or the importance of sending all necessary documentation with every referral. Lack of coordination among caregivers – Did you know? Lack of coordination among caregivers are endemic and contribute to an estimated 44,000 to 98,000 deaths from medical errors each year. Follow-ups – Many primary care practices do not follow-up after they’ve referred a patient to a specialist. They vest the responsibility of scheduling a specialist visit with the patient. According to the Archives of Internal Medicine, this process does not happen in 50-60% of referrals that are made, putting patients at risk. Delays – The patient faces extended delays between the time the referral is sent and the time at which the actual appointment is made. As mentioned previously, delays and frustrations with the scheduling process can cause patients to avoid making an appointment, or they may ultimately cancel an existing appointment if the wait is too long. High-cost referrals – Primary care practices that refer patients to high-cost providers are harming their own practice and their patients. Exorbitant price tags affect reimbursement for PCPs and scare patients away from the idea of seeing a specialist, despite their medical conditions. Value-based care is taking the center stage in the healthcare industry. It is high time that primary care providers and specialists find ways to eliminate communication deficiencies and create a bridge for communication. It will ensure a more well-rounded and positive patient experience. Introduces a collaborative design that connects primary care providers with specialists on a single and uniform network. Electronically-connected specialists form network of care collaboration, where both parties are responsible for the timely care of their mutual patients. Secure electronic notifications provide quick and reliable information between PCP and specialist. PCPs now have an enhanced ability to track referrals. Electronic Referral Management has decreased wait times for face-to-face specialty clinic visits. Technology has made amazing achievements in the healthcare industry. From treatments to artificial organs, recent changes in innovations have performed incredible feats. Care coordination, however, has just arrived at its technological infancy. Are you interested in learning more about how automated care coordination work-flows can improve referral management? Schedule a demo with us! This entry was posted in blog, Referral Management and tagged medical referrals, referral management, referrals on March 29, 2019 by Helena Nancy.